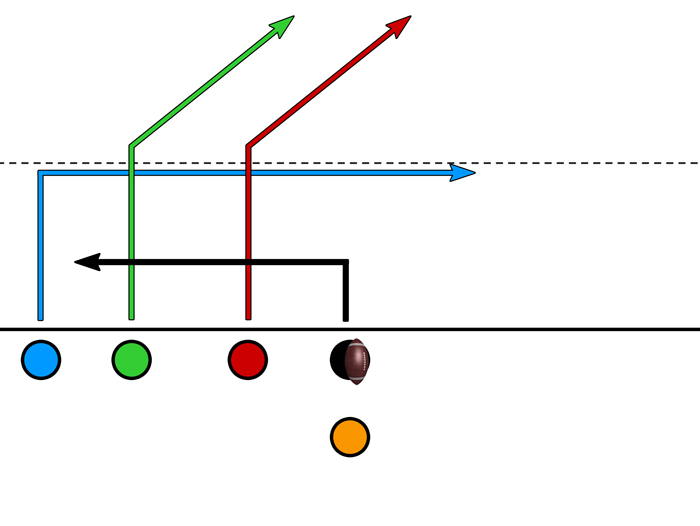 The Wide receiver (Blue) runs a 7 yard Drag route. The two other receivers each run post routes that continue to the opposite side of the field. The center delays a couple seconds then runs an out toward the strong side of the field. Depending on the defense, you may want the Red receiver to run a flatter route (more toward the sideline) while the outside slot receiver runs a skinny post to get further down the field. This may force a single defender to pick who to guard leaving the other open. 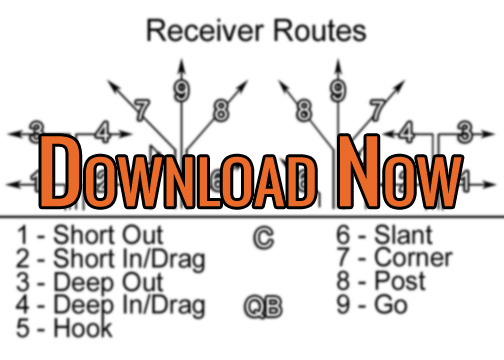 The quarterback should look for the two deep routes first before coming back down to the 7 yard drag across the middle and the Center on the Out route. Play Variation: You can make the Blue run a short drag and have the center run a deeper out. This may open up a deeper pass in the corner of the defense, but your quarterback will also be reading the routes deep to short and back to deep. You can also have the Blue receiver sit down in the middle in the field instead of continuing the square in across the field. This can give less skilled quarterbacks a stationary receiver to throw to.